You go to Rome to meet the Pope and you go to Silicon Valley to meet your investor. A common myth is that almost all Silicon Valley investments are made locally (startups headquartered in the Valley). I analyzed the data and was surprised to find that things were quite exaggerated. The truth is there is no need for a high-tech startup to be in the Silicon Valley to attract high-tech investment. In fact, 44% of all Silicon Valley investments are made into companies not located in the region. To analyze the geographical trends of high-tech investments, I used deals recorded on CrunchBase, the pre-eminent, crowd-sourced repository of data about the startup ecosystem. The data references “early” stage investments such as angel and seed rounds to grants, and “mature” stage investment rounds such as Series-A through to exits via acquisitions or IPOs. In 2015 alone, CrunchBase reported 22,500 rounds of tech startup investments worldwide. Because only half of the reports contained geographical data, I pulled the data down to 11,300 rounds of investment. I took into account that most investment rounds are made by groups of independent venture funds and individuals. Thus, startups establish a direct relationship with each prospective investor and vice-versa: we call this a deal. Consequently, the 11,300 rounds of investments translate into 22,700 deals. To reiterate, the resulting sample size of 22,700 includes data about the regional affiliations of both the start-ups and the investors. Due to substantial differences in how decisions are made, I decided to analyze the sub-sets of early and mature companies separately. Possibly reflecting on the vibrancy of the start-up ecosystem, investments in “early” stage companies are defined per CrunchBase as seed rounds, angel investments, convertible notes, or grants. 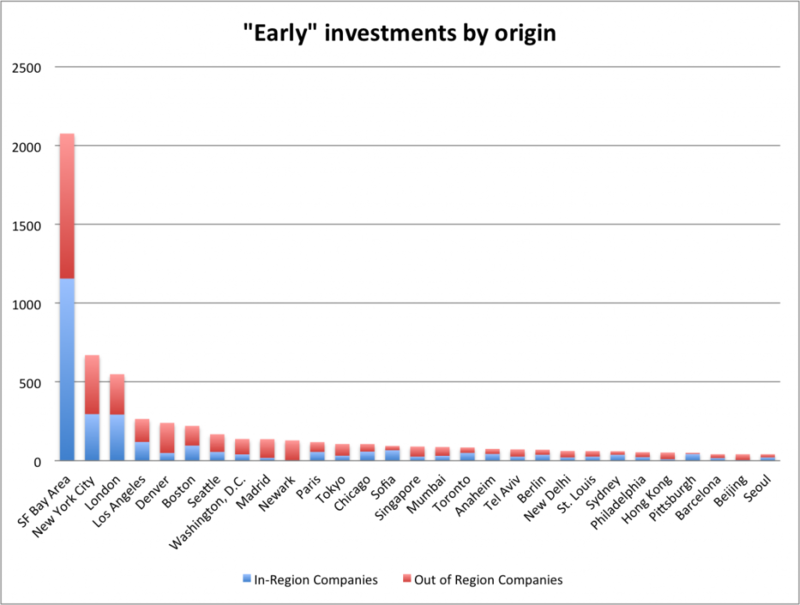 While crowd-funding rounds are also relevant to early-stage companies, I excluded them from the analysis given the challenge in tracking the regional affiliation of such investors. Investments in “mature” stage start-ups are identified as venture capital and debt financing rounds. The counter-intuitive finding is the extent to which deals are consummated outside the region where investors are based. Only 56% of the deals made by Silicon Valley investors are local! Of the 44% deals made by Silicon Valley based investors with early stage start-ups headquartered elsewhere, 10% were based in New York and 5% in Los Angeles. Companies located outside the USA also found in favor of Silicon Valley based investors. Of the 14% that are made overseas, major destinations include India, Canada, and Great Britain, attracting each about 2% of the investment rounds. Unsurprisingly, investors outside of Silicon Valley have also been actively resorting to cross-borders deals. In fact, there are instances where they clearly prefer out-of-region investments to in-region deals. Newark-based investors are a case in point: only 1 out of the 129-recorded deals was entered locally. Silicon Valley (31 deals) and New York (23 deals) were the main destinations for Newark’s high technology venture capital. Investors based in Denver offer further proof: 20% of their deals were targeted locally, with New York (43 deals), Silicon Valley (35 deals), and Seattle (14 deals) proving fruitful hunting grounds for most of their capital. Out of the major investment regions, only Silicon Valley and London marginally favor local deals: 56% and 53% respectively. Succeeding them are New York and Los Angeles, which have a shade below half their portfolio investments in local companies: 44% and 45% respectively. In aggregate analysis across the “early” dataset, a decent majority of deals (57%) are entered into with out-of-region early stage start-ups while local companies make up the balance 43% of the deal flow. In continuation to early stage trends (43% of local deals), the “mature” stage investments present an even more interesting picture with local deals dipping to 34%. Silicon Valley is an outlier in this sub-set with a shade over half their deals (53%) transacted locally. Investors in all other areas prefer deals outside of their regions. For instance, in-region deals in a few major cities are as follows: New York – 27%, Boston – 35%, London – 39%. 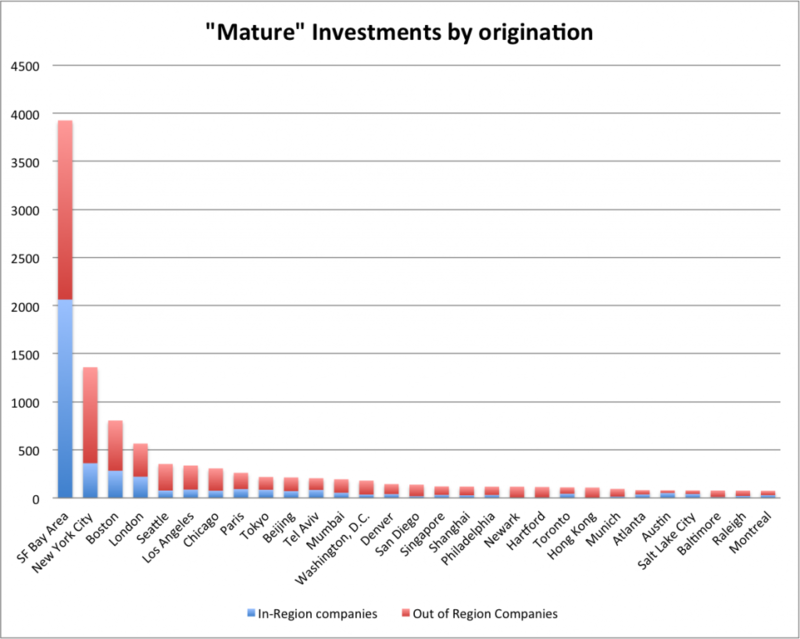 Of the 47% “mature” deals Silicon Valley-headquartered investors conclude with out-of-region “mature” stage start-ups, 8% are with companies based in New York, 4% in Boston, and 3% in Los Angeles. 15% of Silicon Valley’s deal flow is with overseas-based startups: India attracted 4%; China and Canada 2% each; while Great Britain, Israel, Singapore, Germany, and Brazil got 1% of the deals each. A key highlight is the stark difference in deals with Chinese start-ups: while only 0.2% of early stage investments are destined for China, it ranks much higher (2%) where it concerns “mature” investments from Silicon Valley, placing second to India. Investment in high growth technology start-ups is not regionally biased to the extent one might assume. Our analysis of a reasonably large sample size from Crunchbase’s dataset for 2015 proves that a reasonable majority (57%) of early stage deals (“seeds”, Angels, etc.) are concluded with start-ups based outside of the region where the investment firm is headquartered. This trend accelerated with deals involving “mature” stage (Round A, B, C) investments with nearly two-thirds of the deal flow (66%) directed towards out-of-region start-ups. Investors would do well to keep tabs on emerging start-up ecosystems in addition to the well-established hunting grounds.